in the state while strengthening its North American research and development operations. "The expansion of this campus is a key element of Toyota's ongoing unification of our North American operations, which includes a new headquarters in Plano, Texas," said Jim Lentz, CEO, Toyota North America. 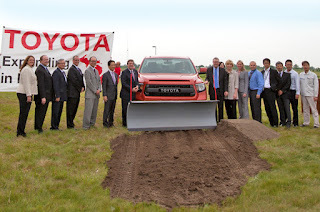 "Investments here in Michigan will intensify Toyota's engineering, product development and procurement capabilities. The impact of this will be felt by our customers through improved quality, adoption of new technologies and greater value of the vehicles we produce." Toyota is investing US$ 126-million in the project, which includes construction of two new buildings in York Township. The landscape will add a new prototype facility for vehicle development and a Supplier Center. The Supplier Center will allow Toyota to forge even stronger alliances with its supplier partners. This new facility will enable day-to-day collaboration between the purchasing group, engineering design team and supplier partners to better satisfy the needs of Toyota customers today and into the future. The TTC expansion also enlarges Toyota's powertrain development facility on its Ann Arbor Township campus. This element of the project will better position Toyota to develop engines and automatic transmissions for the North American designed and manufactured vehicles. As part of the expansion, Toyota is relocating more than 300 team members to Michigan. The moves include direct procurement and supplier engineering development positions currently based in Erlanger, Ky. and vehicle development and powertrain functions that are presently in Calif. These moves further Toyota's commitment to drive more local decision-making and ultimately faster, more precise response to the needs of the marketplace. Toyota team members who will be moving to Michigan joined Lentz, Toyota Motor North America Executive Vice-President/Chief Administrative Officer Osamu 'Simon' Nagata and Toyota Technical Center President Seiya Nakao in the celebration. During the event, the soon-to-be Michigan residents stood at the construction site in the outline of where their future office building will sit. Tundra Chief Engineer Mike Sweers piloted the plow that moved earth for the official start of construction. The event also featured a very heartfelt donation of three Tundra pickup trucks, one to each of the three different fire departments that serve Toyota's two regional facilities - Ann Arbor Township, Saline and Milan. As Lentz presented truck keys to each fire chief, he expressed Toyota's sincere appreciation for the fire fighters' work in keeping Toyota associates safe, be it through routine inspections or the occasional emergency call. All construction will be completed in late 2016.